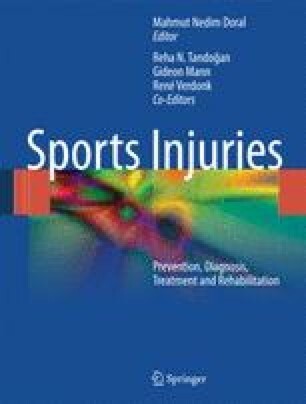 A prospective study of thigh muscle injuries in European male professional football teams was carried out during the years 2001–2008. The objective was to evaluate the risk and circumstances of thigh muscle injuries in a homogenous material of male professional football players. The participants were first team squads of 21 teams selected by UEFA as belonging to the 50 best teams in Europe. The study design followed the consensus on definitions and data collection procedures in studies of football injuries outlined by FIFA. All muscle injuries (total or partial ruptures, cramp and soreness) resulting in the player being unable to fully participate in training or match play (i.e., time loss injuries) were recorded. A total of 1,581 muscle injuries (19% of all injuries) were reported and 861 (54%) of these affected the thigh muscles. Sixty-eight percent of the thigh muscle injuries were hamstrings strains, 29% quadriceps strains and 3% strains to other thigh muscles. As a mean, a team with 25 players can expect ten thigh muscle injuries each season. The risk of a hamstring strain is 11 times more common in matches compared to training and the majority of hamstring strains occur in sprinting and running situations. Quadriceps injuries were significantly more common at shooting compared to hamstring injuries. At top professional level, most teams use radiological examinations for diagnosis of muscle injuries. MRI and ultrasonography seem to be equally frequently used for diagnosis among the clubs in this study. We gratefully acknowledge the clubs involved in the study. The help from the medical personnel and the contact persons are greatly appreciated: Rodolfo Tavana and Bill Tillson (AC Milan), Piet Bon and Edwin Goedhart (AFC Ajax), Leo Groenweghe and Jose Huylebroek (RSC Anderlecht), Joao-Paolo Almeida and Paulo Rebelo (SL Benfica), Egid Kiesouw (BV Borussia Dortmund), Gary Lewin (Arsenal FC), Bryan English and Alex Nieper (Chelsea FC), Dimitri Dobbenie, Jan de Neve and Michel D’Hooghe (ClubBrugge KV), Jordi Ardevol, Lluis Til, Gil Rodas, Ricard Pruna and Ramon Canal (FC Barcelona), Dieter Gudel, Oliver Dierk and Nikolaj Linewitsch (Hamburger SV), Francesco Benazzo, Franco Combi, Giorgio Panico, Cristiano Eirale and Pier-Luigi Parnofiello (FC Internazionale Milano), Fabrizio Tencone and Antonio Giordano (Juventus FC), Mark Waller (Liverpool FC), Roddy McDonald (Newcastle United FC), Mike Stone and Steve McNally (Manchester United FC), Hakim Chalabi (Paris St Germain FC), Nelson Puga (FC Porto), Cees-Rein van den Hoogenband and Luc van Agt (PSV Eindhoven), Ian McGuiness (Rangers FC), Denis Bucher (RC de Lens), Luis Serratosa (Real Madrid CF), Paco Biosca and Viktor Kirilenko (Shakhtar Donetsk) and Pierre Rochcongar (Stade Rennais FC).